Happy Tuesday to all my listeners and viewers and thank you for helping support a show with a positive message each and every morning at 8am on 1250 on #ThatBusinessShow. Please visit http://www.tampabayradio.com for show updates and On Demand availability of all shows both audio and video and reach out to me directly at Jamie@tampabayradio.com to promote yourself on the airwaves! 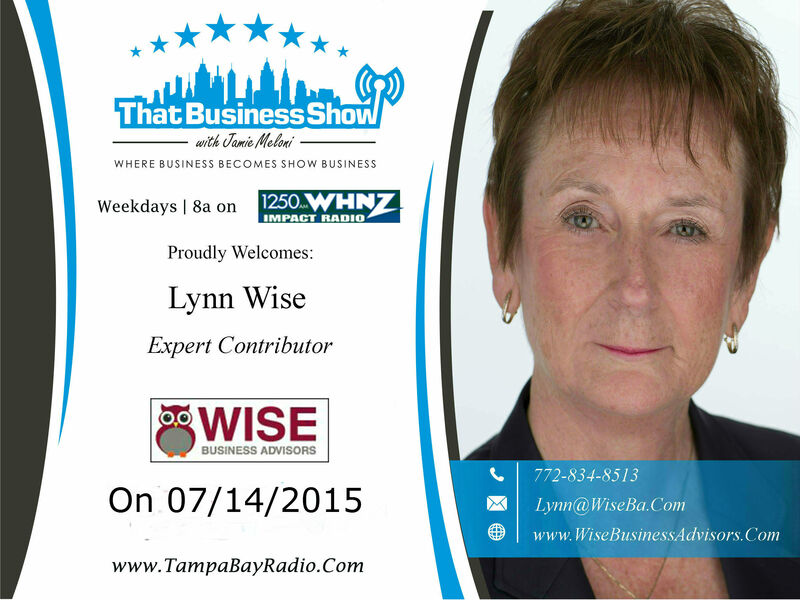 Lynn Wise, Expert Contributor and Founder of Wise Business Advisors, checked in at the top of the hour on today’s show. She is the author of her recently released book, “Build It, Grow It, Sell It! Nine Steps to a Thriving Contracting Business” and Lynn’s accomplishments include building businesses from the ground floor to profitable and successful businesses and was featured in Hardware Age for her accomplishments. Lynn’s business focuses on Contractor support services. She is about to launch her new website http://www.contractorincharge.com which will replace her existing http://www.wisebusinessadvisors.com website and will focus on three key areas of support for Contractors: Sales and Marketing, Back Office and Operations, and Financial Management and Cash Flow. Lynn and her staff will provide services including customer support and answering services so consumers always get a live called on the phone line when requesting services and will provide reports based on call trends. In addition, her platform will interface with QuickBooks Online for invoicing services and she assists Contractors with follow up calls and surveys to consumers along with social media and website development. Lynn’s ideal client is an experienced Contractor running 2-3 trucks who is looking to grow their existing practice. She has openings for 10 Contractors and has 6 spots still available so act quickly and reach out to her today – 772-834-8513 or Lynn@WiseBa.Com! 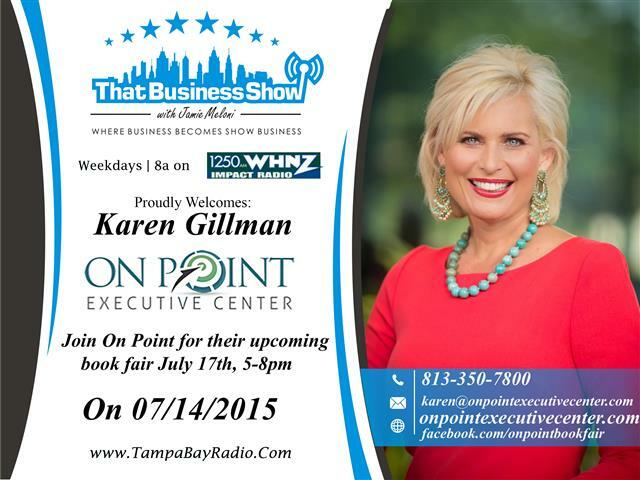 On the 2nd half of the show, I welcomed Karen Gillman, team leader at On Point Executive Center. The Center, located at 3030 N Rocky Point Dr in Tampa acts as an office away from your office or can serve as your primary office for the traveling businessman. Through Karen’s leadership, she has helped triple the company’s revenue and has brought in over 1000 new clients. Karen joined the show today to talk about the upcoming book fair they are hosting at the Center on July 17th from 5pm to 8pm and is free of charge to the public. Karen herself is an author and released “It’s Never Too Late”, which chronicles her 10 year battle with weight loss in which she achieved success via Lap Band Surgery and lost 145 pounds. Learn more at http://www.karengillman.com and you can pick up her book at Amazon.com as well by clicking here. Alongside Karen in studio were two other featured authors, Joryn Jenkins and Diane Daniels, both of which will have their books featured at the book fair on July 17th as well. Joryn Jenkins is a Tampa based attorney specializing in Divorce and her book, “War Or Peace”, details the emotional component of divorce in much greater detail than other similar books and highlights many stories of her career in Divorce Law. The book is an entertaining read and will appeal to a wide audience, not just those affected or considering divorce. You can learn more about Joryn’s book and her services at http://www.openpalmlaw.com and the book is available on Amazon by clicking here. Diane Daniels joined us in studio as well and is the author of “The Medicare Survival Guide”. Her book provides an easy to understand comparison of Medicare plans and is a must ready for anyone aged 65 or older. Diane is an experienced insurance agent and disseminates a wealth of information in her book. Diane invites listeners to her website, http://www.callsamm.com and the first 10 listeners who visit and request a copy of the book will receive a free copy. The book is available on Amazon.com as well by clicking here.